White Paper - ZYLIA PORTABLE RECORDING STUDIO. MULTI-TRACK MUSIC RECORDING WITH ONE MIC. moving a recording session to a recording studio which is very time consuming. Figure 1. Flowchart of the music recording process. In contrast, ZYLIA simplifies music recording process and allows musicians to focus on their performance. The system records a full 360 music scene and decomposes it into a multi-track recording which is further mixed into a balanced music recording. This process is done automatically without any knowledge required from the musician point of view. Moreover, ZYLIA ZM-1 replaces several microphones, stands, a mixer and a sound registering device as well as meters of cables that tend to get tangled up. Instead of using multiple spot microphones ZYLIA is located in the middle of the room between musicians. The recorded audio tracks are processed by the dedicated software which allows creating so called Virtual Microphones. They provide an adaptive isolation of sound sources (musical instruments). As a result, musician or sound engineer receives separated tracks of the recorded instruments. The software allows for steering a Virtual Microphone at any direction in the 3D space. The main advantage of this approach is that all those adjustments may be done without repeating the pre-recording and recording step because it is possible to change a spatial characteristic of Virtual Microphone in the post production phase. ​Years of expertise in audio processing, music recording and hardware design have been combined into the ZYLIA “Portable Recording Studio” and throughout the development process we have paid the utmost attention to every single product detail. Our goal was always to combine cutting-edge technology with simplicity and elegant product design. Building and testing of the ZM-1 microphone array with the corresponding DSP algorithms required thousands of hours spent in laboratory and anechoic chamber. This also involved performing multiple scientific experiments and measurements done with equipment of the highest precision. Figure 2. 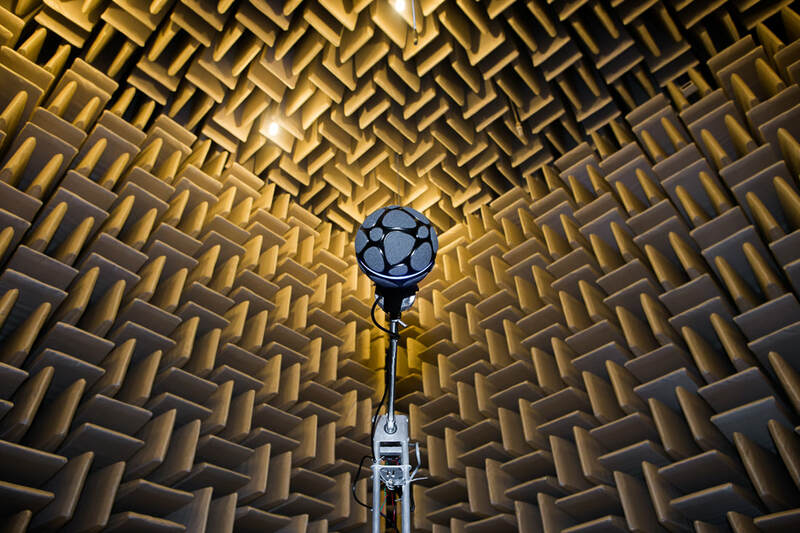 ZYLIA ZM-1 in anechoic chamber. Basic Virtual Microphone mode – it simulates a directional microphone which allows to isolate any part of the surrounding 3D space, including ambient sounds, room acoustics, etc. High Separation mode – additional post‑processing algorithms for simulating close microphone behavior. The ambient sounds and background noises are reduced and the separation between the sound sources is even higher. Figure 3. The concept of Virtual Microphones. Figure 4. Overview of ZYLIA hardware and software features. ​ZYLIA ZM-1 is a special type of microphone array that was designed for high quality multi-track audio recording. 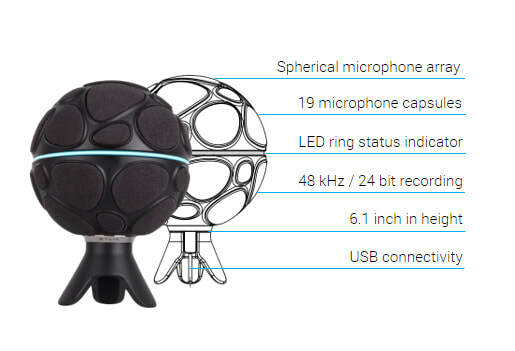 In order to capture selected sound sources on specified directions and distances the ZM-1 microphone uses 19 omnidirectional capsules (based on state-of-the-art MEMS technology). Figure 5. ZYLIA ZM-1 specification. ZM-1 is built using omnidirectional condenser microphone capsules based on Micro‑Electro‑Mechanical Systems (MEMS) technology. MEMS is driving the next evolvement in condenser microphones. These small‑sized microphones take advantage of the enormous advances made in silicon technology over the past decades—including ultra‑small fabrication geometries, excellent stability and repeatability of parameters, and low power consumption—all of which have become uncompromising requirements of the silicon industry. All capsules used in ZM-1 have very tight and time‑constant tolerances, so that the sound is consistent from mic to mic and the highest performance of ZYLIA’s DSP algorithms is guaranteed. Figure 6. Frequency response of single capsule of the ZM-1. 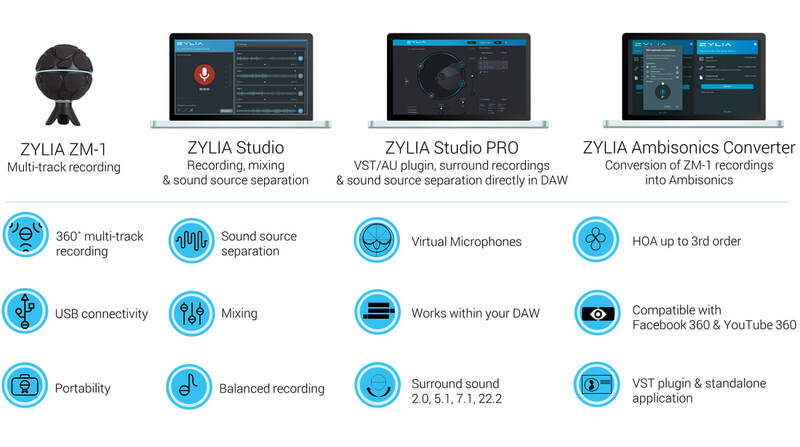 ​ZYLIA Studio is a dedicated application acting as the “Control Center” for the ZYLIA ZM-1 microphone. It enables musicians and bands to record songs and extract recorded instruments into individual tracks. This allows later fine-tuning of the mix controlling gain level and panning or exporting of tracks to an external DAW. Figure 7. ZYLIA Studio recording screen. Recording with ZYLIA Studio is organized into sessions. Within each session you can record as many takes as you want. Working process with ZYLIA Studio was made as simple as possible and can be divided into several stages, such as calibration, recording of your performance, separation and mixing. ZYLIA Studio provides a function of automatic detection of sound source position in the surrounding sound field. This means that user does not have to manually enter the positions of recorded sound sources. The process is called a calibration. During the calibration, an 8 second sample of each instrument (or other sound source) is recorded. Right after each recording, the application estimates position of the particular instrument. Once the position of one instrument is known, position of the next one can be estimated. You can also omit an automatic calibration process and choose one of listed band presets which best matches the positions of instruments in your performance or you can use one of the surround presets. At any time of your recording with ZYLIA Studio you can recalibrate any of the instrument, adjust its position manually or add a new instrument to the existing setup. 24-bit 48 kHz PCM WAVE – requires 9.8 GB / hour of disk space (1.1 Mbps per channel) and the duration of a single take is limited to 25 minutes. 24-bit 48 kHz lossless compression WavPack format – requires about 4.8 GB / hour of disk space (576 kbps per channel) and the duration of a single take is unlimited. After recording you can listen to the stereo preview of your take. profile 1 – it offers highest quality of your tracks and is recommended for recording music performance. profile 2 – it provides better separation while reducing the background noise and echo. It is recommended for speech recording. ZYLIA Studio’s mixing panel enables you to quickly prepare a stereo mix of your separated tracks. You can easily adjust the volume and panning of individual tracks. Your mix and separated tracks can be exported as 32-bit 48 kHz Floating-Point WAVE files. ​ZYLIA Studio PRO is a VST/AU plugin which gives you an access to spatial filtering and signal separation directly within your Digital Audio Workstation software (DAW). The ZYLIA Studio PRO transforms a single 19 capsule microphone ZYLIA ZM-1 into an unlimited number of Virtual Microphones. Figure 8. The ZYLIA Studio PRO VST plug-in view. Possibility to set multiple Virtual Microphones with different polar patterns or characteristics - live or during post‑production! ZYLIA Studio PRO VST extends all the features provided by ZYLIA Studio. You can set any number of Virtual Microphones and adjust their characteristics and positions, during the recording or in the post‑production stage. Outputs of the Virtual Microphones are available as separated tracks directly in your DAW software, so you can apply effects and mix the tracks in the same way as for any other single-track recording. Figure 9. ZYLIA Studio band presets. Figure 10. ZYLIA Studio surround presets. The ZYLIA Ambisonics Converter converts the ZM-1 multi-channel recordings into Higher Order Ambisonics (HOA) and enables you to prepare 3D audio recordings for playback on the “Facebook 360”, “Youtube 360” and other platforms. ​Figure 11. ZYLIA Ambisonics Converter screen. The ZYLIA Ambisonics Converter application converts 19-channel recordings from ZM-1 into the desired HOA format. The recording can be done with ZYLIA Studio, ZYLIA Studio Pro or any type of recording DAW software which recognizes the ZM-1 as a recording device. The input files are required to be a 19-channel WAVE or WavePack with 48 kHz sampling rate. The output is saved as a multi-channel 32-bit Floating-Point WAVE files according to the desired HOA configuration. The VST plug-in provides the same HOA features and enables you to record and convert to HOA online within your DAW software. Figure 12. 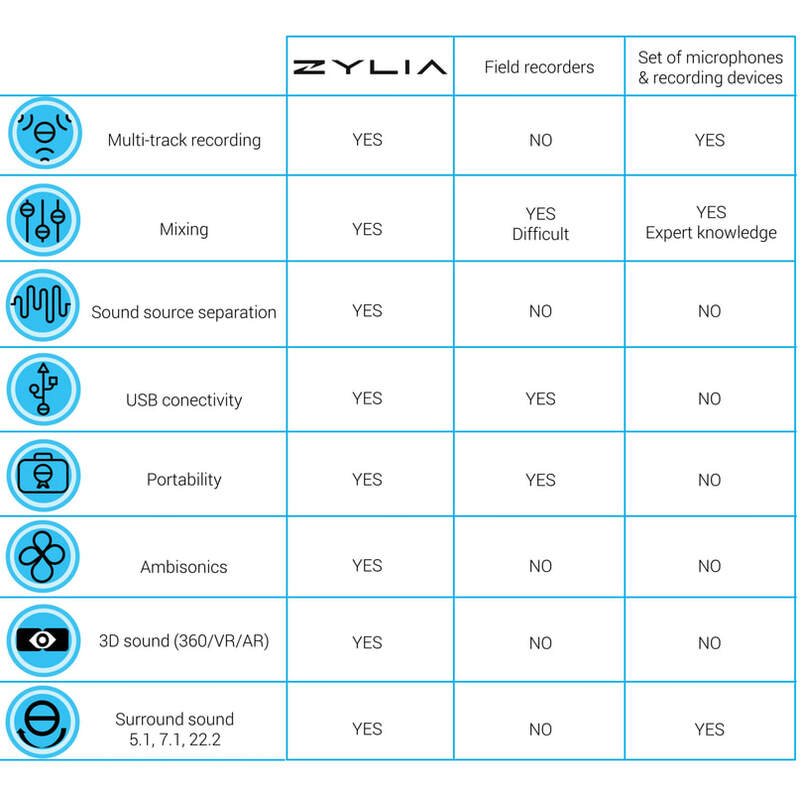 ZYLIA vs traditional recording equipment. In order to quickly record a rehearsal or demo track you can use a simple field recorder. In typical field recording scenario you receive one (predefined) stereo mix containing all of the instruments playing in the music performance. The below time‑frequency energy maps show that both, left and right channel contain the sounds coming from all instruments. 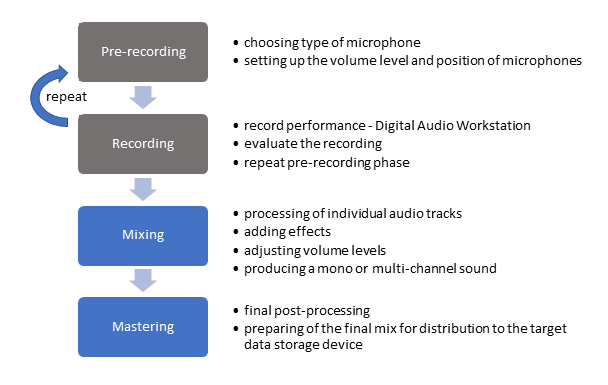 With such recording, you cannot change the balance of the individual sound sources and the sound editing in post‑production process is extremely limited. Figure 13. Stereo field recording of three instruments. 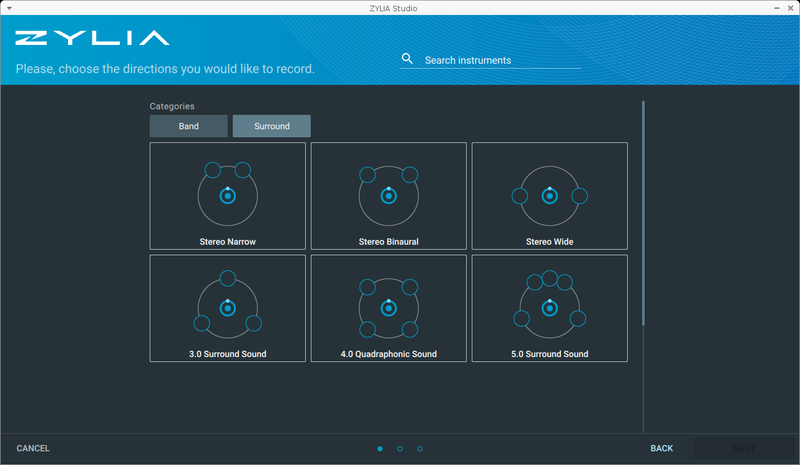 ​ZYLIA ZM-1 microphone and ZYLIA software introduce a new way of multi‑track recording, which gives you a possibility to separate tracks of individual sound sources. Instead of raw stereo track you receive a number of mono tracks corresponding to each instrument or vocal. This gives you an opportunity to fully manipulate the balance and the level of audio sources as they would be recorded with a set of spot microphones. Figure 14. A multi-track recording with sound source separation.